1. Log Wagon - 1850’s to 1915. Used to haul raw logs out of the woods and to the mill. Pulled by 12 to 20 oxen, horses or mules. Large steam tractors were used from about 1905 to 1915. A typical load would be 6 or 7 virgin timber logs 2- to 4-feet in diameter and about 20 feet long. 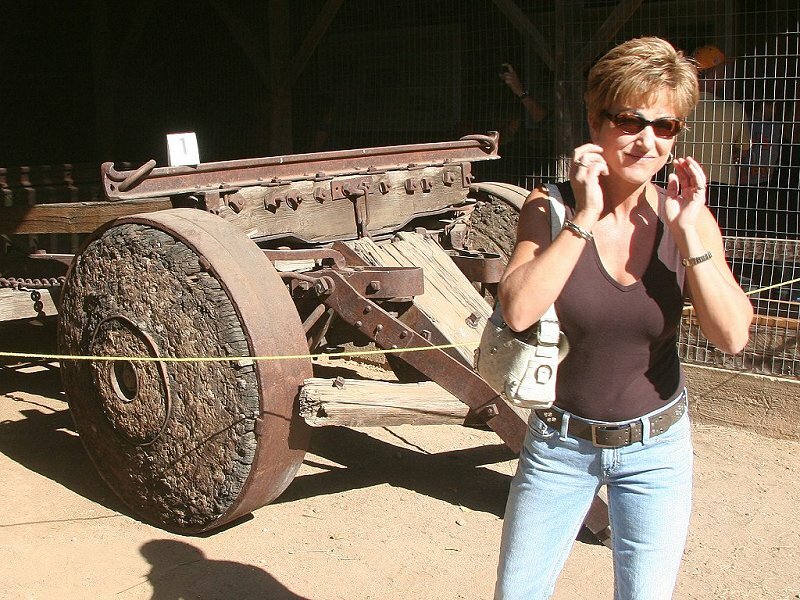 Note wooden wheels made from a slice or “round” of log, pressed firmly against the metal rim when necessary by wood stakes driven into the wheel. Solid wood wheels could carry more weight than spoked wheels. Note lever with toothed ratchet at rear. A “swamper” (teamster) walked behind to move it right or left to apply either brake, thus assisting turns and controlling speed. Tongue, front wheels, and front cross beam of the Log Wagon. 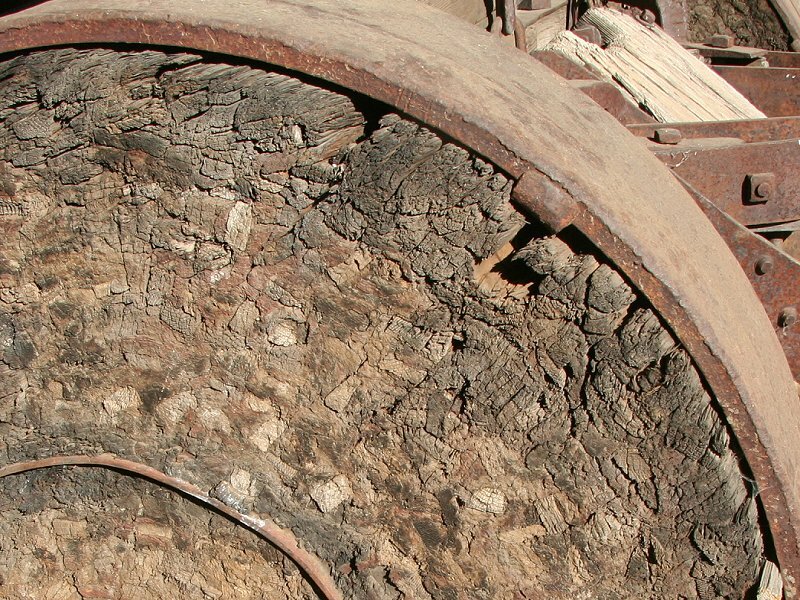 The wheels were made of a solid slice of log, which was turned in a lathe to give a round, smooth outer "rim" about half the width of the central bearing. A heavy steel band (tire) was pressed over the turned log slice. Stakes were pounded into the log slice to give a tight fit against the steel rim. After years of taking up slack with pounded stakes, these wheels appear as much stakes as log slice. Large, sturdy brake beam, with wood brake shoes missing. The brake beam was attached to the steel bar sticking out to the rear in the photo below (also see previous photo). 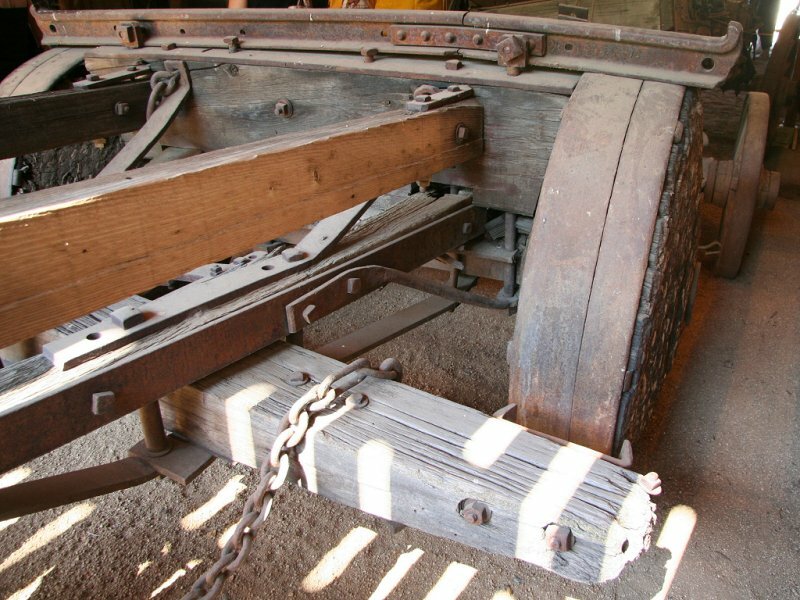 This bar was attached to a long wood handle which the swamper used to rotate the brake beam left (to apply left brake shoe and help turn wagon left) or right (turn right). The heavy wood frame which held the semi-circular ratchet in place is missing (see empty long bolts on either side).